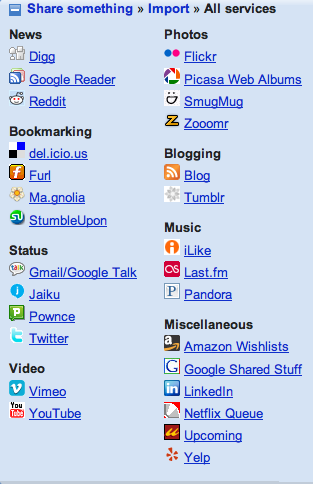 You can tell FriendFeed was built by ex-Googlers because it is so spare, yet brings forth an avalanche of information. The social feed aggregator lets you keep track of your friends across 28 Websites and services, including Twitter, Flickr, Digg, StumbleUpon, del.icio.us, YouTube, blog posts, shared items on Google Reader, Amazon wish lists, and what they are watching on Netflix. It launched in private beta last October, but as of now it is open to the public. This is different than when another startup raises $5 million. We won’t rush out there and start hiring like mad. We just wanted to have the funding issue taken care of so we could focus on the product and users. Buchheit’s is part of the Google Mafia of early employees who are now avid angel investors. By his count, he has put his own money into about 20 startups, including Xobni, Justin.tv, Zenter (acquired by Google), Meraki Networks, Mint, and ScanScout. At FriendFeed, though, he is one of six employees building it by hand. 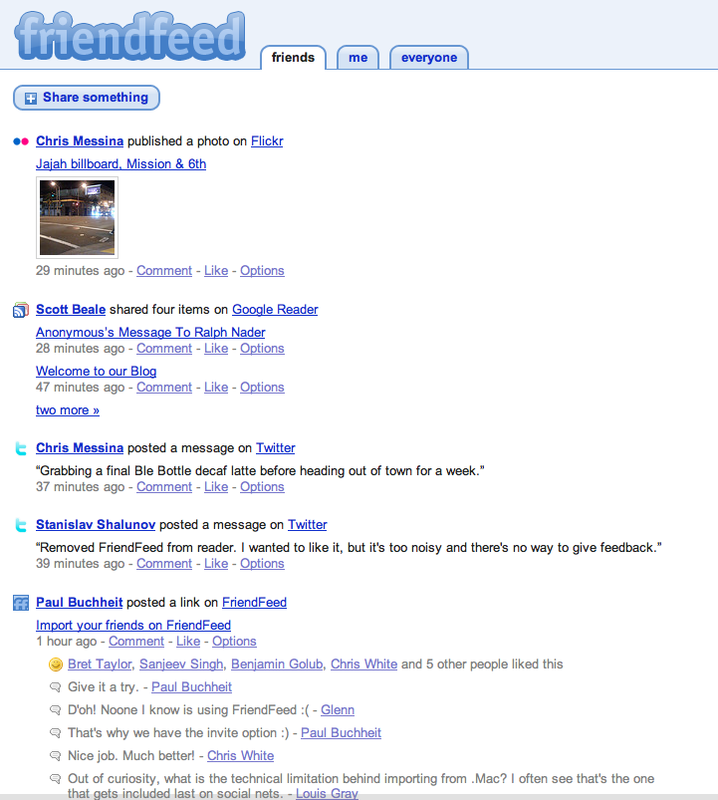 FriendFeed is a way to become aware of what people you know or respect are doing across dozens of different Websites. That super-aggregation of feeds from popular social sites, however, is quickly being copied (see Spokeo, Iminta, Plaxo Pulse, and—one that just launched today—Second Brain). Even Facebook wants to get in on the action by allowing feeds from other services to show up on the News feed of its members. The content imported into FriendFeed from other sites becomes fodder for discussion and socializing around that content. One thing we learned is the importance of that discussion aspect. In particular, because the discussions are limited to the social network of the person, they do not devolve to lowest common denominator of discussions on the Web. For instance, click on the thumbnail at left and you will see a discussion thread in response to our post about Facebook targeting FriendFeed. It very much reads like a discussion among friends. 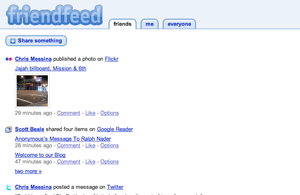 The trick for Friendfeed now that it is open is to keep that sense of intimacy. As you add more friends to FriendFeed, following them all can quickly become overwhelming. That is why the company is building in algorithms to automatically promote the most important stuff and help you filter out the rest. Any items that are commented on or starred as being “liked” get more play. You can see those items from friends of your friends, even if you don’t subscribe directly to their feeds. There are also extremely granular controls. Do you have a friend who suffers from Twitter disease and spams the minutia of his life 20 times a day? You can turn off his Twitters to hide them from view, and just enjoy the occasional YouTube video he finds. And if he is really annoying, unsubscribe from his feeds. Subscribing and unsubscribing to people does not yet carry the same social meaning that unfriending someone on Facebook does. Right now, it is just about information flow. That won’t last however. 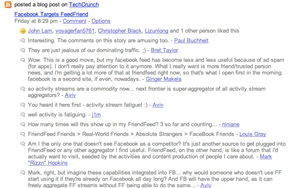 FriendFeed is still very much a work in progress. There is no search box (coming), there is no mobile version (coming), and there is no way to group or organize feeds other than chronologically. The site just added tabs earlier today (“friends,” “me,” and “everyone”). 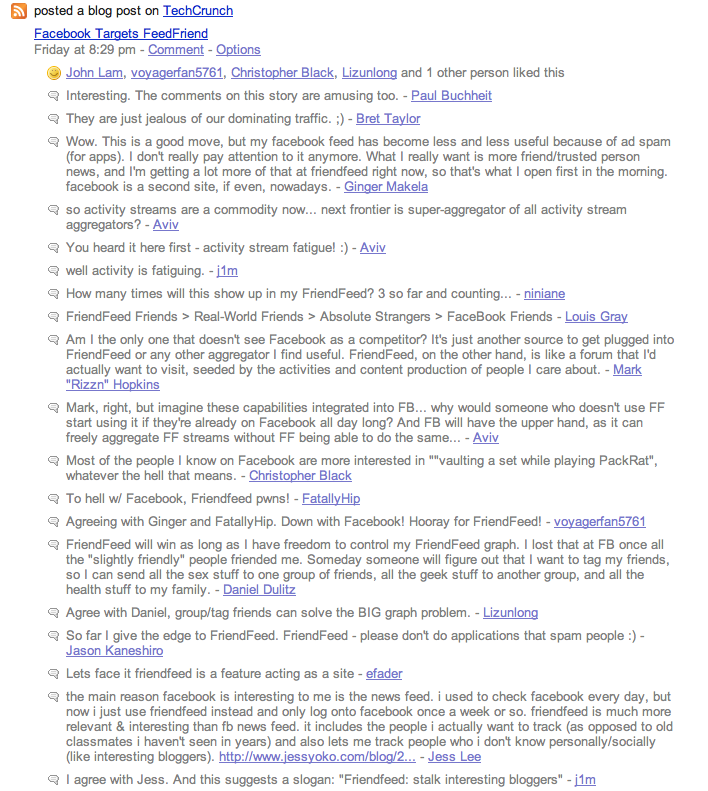 Yet there is something pure about FriendFeed that I hope does not get lost as more people (and features) join.